The soul in the body is somewhat like the flame on a wick. The fire consumes the wax or oil, without being used up itself. The body, not the soul, is consumed by life. Even if there are many flames, there will be only a single light in the room. Although there are many souls in the room, there is only one life present. The candle has form while the flame has no form of its own. The body has form while the soul is formless. The formless flame is directed and moved about by the wind. Wind in Hebrew is the same word as Spirit, Ruach, which directs and moves the soul about. The size of the flame is not determined by the size of the candle. The "size" of the soul is not determined by the size of the body. A small-bodied person does not necessarily have a "small" soul. Although the candle has many characteristics or possible uses such as sealing and lubricating, its primary purpose is to give light. The same is true for the body. Although it has many functions, its essential task is to house the soul in order to bring light into the world. No matter what color or shape the candle is, the flame's color does not change. No matter what color or shape the body is, the "color" of the soul is unaffected. The hotter portion of the flame is the upper portion. The soul is the higher aspect of man. One can light many thousands of candles from a single candle without losing the slightest amount of original light. In fact, surrounded by other lit candles, it stands in even more light. The soul can also ignite many other souls, making them aware of life's purpose, and then it becomes even more illuminated, because it was instrumental in spreading light. It is easier to relight a wick than it was to light it in the first place. A soul that once knew but went astray, one which has forgotten, is easier to relight, to remind, and to bring back than is one that has never been aware. In the end, after the flame has consumed all of the candle, it itself must go out. So it is with the soul. After its desires have raced the body through its 70 or 80 years, the body is consumed and then the soul must also go out. The flame always goes up, reaching towards heaven. The soul also strives to go up, to remember its true identity. Excerpted from There is One by Gutman Locks. 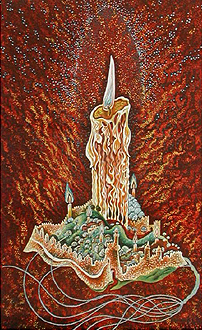 Illustration by Chassidic artist Baruch Nachshon. What is a Soul (Neshamah)?